Bruce Robbins, Professor of English and Comparative Literature at Rutgers University and a co-editor of Social Text, is the author of: Feeling Global: Internationalism in Distress (NYU Press, 1999), Secular Vocations: Intellectuals, Professionalism, Culture (Verso, 1993), The Servant's Hand: English Fiction From Below (Columbia University Press, 1986). 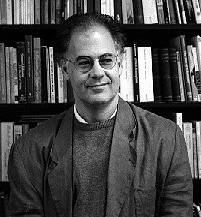 He has also edited several collections, including: Cosmopolitics: Thinking and Feeling Beyond the Nation (University of Minnesota Press, 1998), coedited with Pheng Cheah; The Phantom Public Sphere (University of Minnesota Press, 1993); and Intellectuals: Politics, Aesthetics, Academics (University of Minnesota Press, 1990). His work on the ethical and moral obligations of intellectuals places him among the forefront of academics whose scholarly works strive to shape public discourse. As Robbins writes in Feeling Global, the most "pertinent questions are [...] what you live for, how you live, what you eat, whose children you take care of, who takes care of yours -- all the ways in which the personal, as Cynthia Enloe has put it, is international" (172). Fri., March 8, 8:00 p.m.
Bruce Robbins on "The Clash of Civilizations and the Critique of Culture." Student Union, Little Theater. Free and open to the public. This page was last updated on 7 February 2002.